Todd Hollfelder is one of nearly 222,000 Wisconsinites convicted of two or more OWI's. He says alcohol had always been a part of his young adult life. "I was a party boy I just like to go out and I drink and I drank too much," said Hollfelder. Hollfelder admits his decision to get behind the wheel was neither smart nor responsible. "I spend all my money at the bar and didn't have money to pay for a cab. Its terrifying to put the value of your vehicle ahead that and other people and yourself," he said. The night he was arrested Hollfelder ran out of gas on the freeway. "The officer pulled up behind me because I had my flashers on and he said I was slurring and that was that, " Hollfeder said. Hollfelder was sentenced to four years for his 7th offense. He remembers the judge's comments. "It was visible I needed to go away. I had been slapped on the wrist so many times and even the judge pointed it out that I had not been punished enough," he said. Hollfelder took part in an early release program with 10 other OWI offenders. He says three out of those 10 are already back in prison. He believes offenders need to be constantly reminded of what they've done through classes and dialogue. "I want to see realistic changes. Education is a big part of everything, conversation is another big part of everything," Hollfelder said. While behind bars Hollfelder, spent days and nights sketching in his cell. 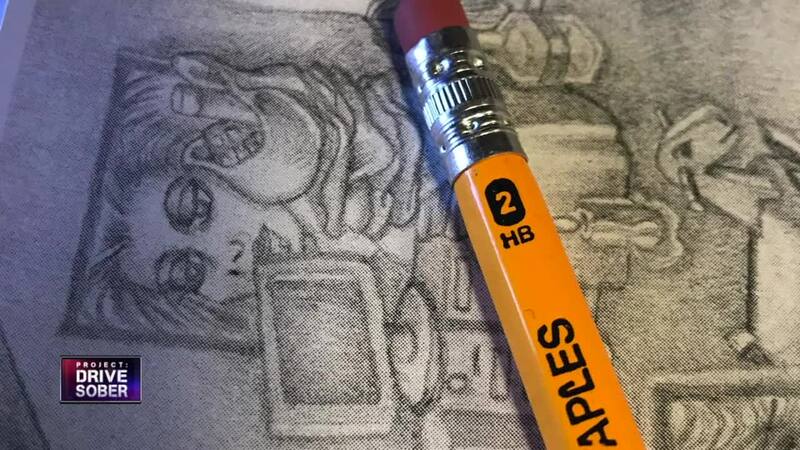 A #2 pencil and a sheet of paper became a life line. "That's my therapy, " Hollfelder said. "I was able to get my feelings out in a lot of ways. I was able to go to other places in my head and make them real." For now, his outlet is at the Milwaukee Art Museum. "This exhibit sitting in is an attempt to engage people and dialogue well we need a conversation about the DUIs," he said. He works as a guide in a new exhibit featuring photos from inside California's San Quentin prison. Todd is not proud of his convictions that lead him down this road of recovery. He just hopes his transparency will lead others toward making a better choice before getting behind the wheel. "If you ask me will I stop drinking? Maybe not. A drink here or there but my car won't be anywhere near me," he said.